Written by WLT supporter Durlabh Singh. Notes from a visit to the Rio Bravo Conservation and Management Area (RBCMA) and its two field stations at La Milpa and Hill Bank. I was met at the airport by Bladimir Rodriguez, the tour guide from La Milpa. As it was already getting dark, we straightaway drove to our destination, which was nearly a hundred miles away. It was a long journey, not helped by partially rough road full of potholes and many bumps to slow down the traffic near the towns. On both sides of the road, there were palm like trees with their graceful canopies of leaves. It was late, when we reached La Milpa reserve, where I was greeted by Ramon Pacheco, the station manager who guided me to my quarters. I got up early for our bird watching or ‘birding’ session. Bladimir and Ramon were ready at 6.15 am start with their binoculars and two other visitors from Sweden. When they spotted an observable bird, they focused the instruments on them and we were able to watch our feathered friends like Ocellated Turkey, Brown Jay, lots of Humming birds, Black-Headed Saltator, Turkey Vulture, Roadside Hawk and Melodious Blackbird; American Redstart Warbler and Magnolia Warbler. We also heard the songs of Thrush-like schiffornius; White- bellied eEmerald, Keel-billed Toucan and Red-lored Parrot. In the afternoon, it was time to go on Cohune Palm trail, trailing through rich varieties of plants. Though the trail was muddy and slippery with recent heavy rains, it was exciting to know about so many kinds of trees and their different leaves, shapes and colours. Cohune palm is rich source of palm oil and its leaves are most useful in making the thatched roofs. I thought that making thatched roofs was a skilled job, which took days to learn, but Bladimir assured me that he learnt this job in about five hours. Bullhorn acacia tree has shoots like horns of a bull and there are plenty of ants living in its hollows. We also saw Air plant which grows in an upside sort of way with its roots growing from tree tops, All Spice (seeds used for making spices), Strangler, Give & Take, and tall Mahogany tree with its wide girth. Mahogany is the national tree of Belize. After dinner we went for a night ride, at the back of an open truck. Bladimir standing with his flood light and when with his keen eyes, he spotted something interesting we stopped and observed the said animal or bird. We observed sleepy raccoon like creature, the Kinkajou, Mottled Owl and Ocellated Turkey. This morning after breakfast, it was time to go on a guided tour of La Milpa Maya site, which was spread over a considerable area where some of the buildings in the central square have been restored. This main square was the administrative center of the Maya settlement where the ruler, lawmakers, priests and other high-ranking people lived. The archeologists have dated the central stela to an exact date of November 30, 780 AD. 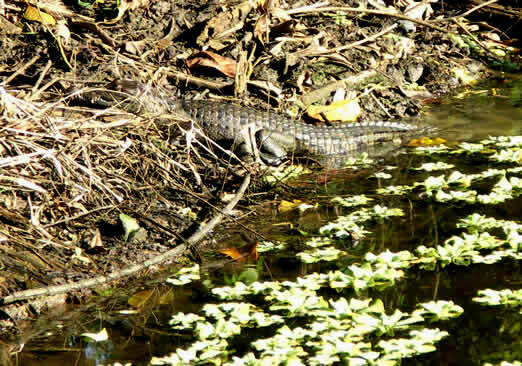 Crocodile at La Milpa. See a larger version of this image here. Walking on theses ruins, reminds oneself the sombre thought that nothing remains forever and how the once mighty and powerful have fallen down to dust. We also observed pieces of broken pottery which were painted red and the colour being derived from the barks of certain trees. There were few hollows dug into the earth where the Maya stored their grains. Ramon told me that sometime back he had introduced a baby Morelet’s Crocodile into the pool at La Milpa and which have now grown into adult and we photographed it while it was basking at the edge of the pool. In the afternoon, it was time for the medicinal trail and noticeable trees observed were: Hog Plum – cure for Gonorrhea, Red Gumbo Limbo, Sunbu Trumpet – cure for diabetes, Wild Yam – can be used as a contraceptive and Breadnut – Good for toothache. Durlabh Singh at Stela 9, Lamanai. The Jaguar Temple is 60 feet high and has two masks on lower parts of staircase resembling a jaguar in an abstract style, reminding us that abstract art is not only the invention of 20th century. Ballcourt- Where the Maya played a ritual game called Pok-a-tok. High Temple- Dates back to 100BC and is 333 meters high and has masks on the front portion depicting the rain God Chac. STELA 9- Lamanai’s best well preserved stela that depicts a ruler of the name Lord Smoking Shell and dates back to 605 AD. Royal Complex – this is where the elite lived within the city core. Reached Hill Bank Field Station early in the afternoon and after late lunch went for canoeing tour on Ram Goat Creek. From the main creek we went around the narrow passages among the mangroves. It was drizzling, which soon turned into a heavy downpour, and luckily I had my umbrella with me, which I used as a protection and as a pushing ram to manoeuvre through the tangled groves. After dark we did a bit of night-spotting on lagoon near Irish Creek observing crocodiles as they came along to see the searching spotlights on the water. 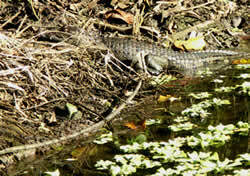 We managed to see few crocs with their snouts above the waters and their eyes shining through reflections. It was a calm and beautiful night with sky full of numerous twinkling stars. Early start for Dangriga via Belize zoo. It is a good opportunity to see the native animals in one place. It is small zoo but well represented in native wild life. There was good opportunity to watch Tapir, Jaguar, Howler Monkey, Toucan, Ocelot and Hawk Eagle. The lunch was arranged at Cheers where Herbert came to meet me and we exchanged our views about wild life protection in Belize. Our journey continued to Dangriga and the rough road gave way eventually to smooth highway. My tour guide left me at Pelican Beach resort where I was going to stay for the following two days. South Water Caye . See a larger version of this image here. 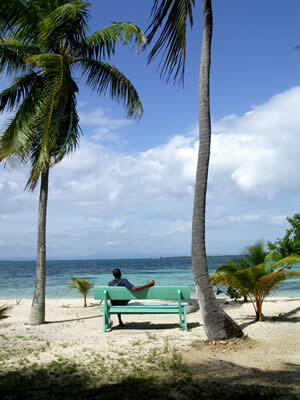 Belizean coast has the longest barrier reef in northern hemisphere and worth seeing. We motorboated in the Caribbean Sea en route to South Water Caye. We visited mangroves before landing at the reef island of South Water Caye. This caye and adjacent barrier reef is a shimmering, picturesque place with white sandy beaches, studded with graceful palms. While returning to mainland, the motorboat stopped near the bird island where Frigate Birds (magnificent), Brown Bobbies and Yellow-foot Pelican can be seen at close quarter. A trip was arranged this morning to see the cultural life of Dangriga and my guide happened to be a musician himself. Bredda David told me that his group was a prominent music maker in Belize. His music is somewhat linked to Jamaican music and its rhythms with songs of love and of social concern. Visits were also made to a doll maker and the museum. The lady had been making dolls since last 30 years and make a living out of it. Her dolls hark to popular and mythical lores. The museum tells the story of migration and settlements of people to Belize. I was informed that even before Columbus, West Africans sailed from Mali to form new settlements in Belize and other Caribbean islands. There was enough time left before my flight and I arranged with David a trip to Blue Hole. The road from the town winded past a beautiful countryside with its lush green vegetation, misty hills and citrus plantations. Truckloads of fruit were being delivered to a factory for making fruit juices and other products. I flew back from Dangriga to Belize International Airport via a Maya Air dozen-seater small airplane. 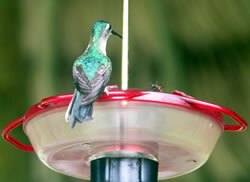 If you would like to visit the Rio Bravo Conservation and Management Area, contact Programme for Belize to make a booking or see www.pfbelize.org. Read more about visiting the World Land Trust's project areas. 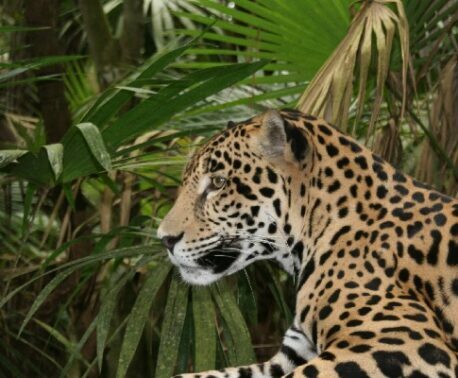 To learn more about the Belize project visit the main project page: Programme for Belize.